Forget 802.11ax. Say hello to Wi-Fi 6. The Wi-Fi Alliance announced that it will add generation numbers to its trademarked Wi-Fi name, which indicates a device meets its compatibility tests, rather than relying on obscure protocol names set by a standards group. This change is purely cosmetic, as it doesn’t affect the certification process or the industry standards group’s work. 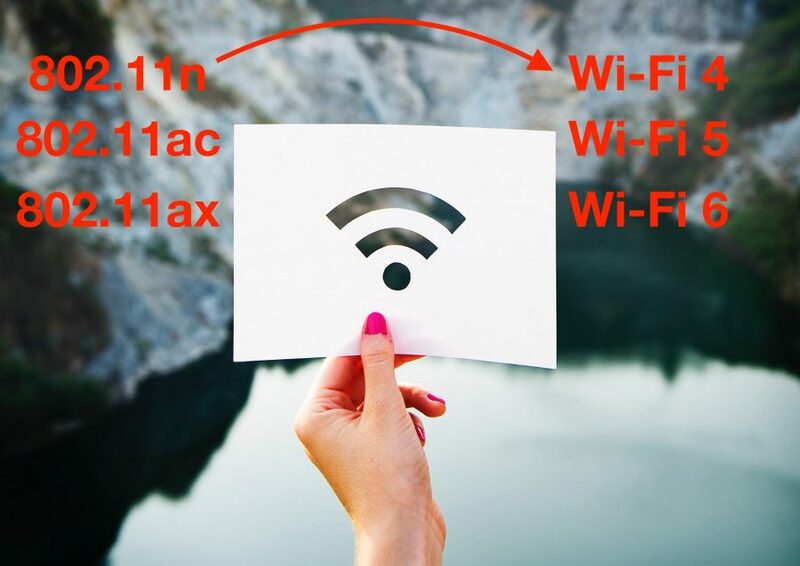 The Wi-Fi Alliance wants operating system interfaces to modify their signal strength indicators to incorporate generational numbering that shows the active connection type. That sounds like a graphical headache, and I expect every operating system maker will take a different approach. Or they may just ignore the suggestion altogether, as it’s not mandatory. The Wi-Fi Alliance wants device interfaces to highlight throughput by generation alongside existing signal strength indicators. This older logo is rather baroque, and even it doesn’t include all the 802.11 standards used in a device. IEEE, an international standard organization, sets naming schemes by major and minor group, and then uses letters and other markers for standards within each group. The 802 LAN/MAN Standards Committee handles all “metropolitan” (large-scale) and local area network standards. Inside of that, the 802.11 Working Group creates task groups that develop lettered standards, like 802.11b and 802.11ac. The working group divided different kinds of work into separate lettered standards, like 802.11e for quality of service (prioritizing different kinds of data, so video isn’t choppy and voice calls are crisp), 802.11i for advanced security (to move away from the weak WEP standard found in 802.11b), and 802.11r (improving handoffs for devices as they move among base stations in a large network). Meanwhile, the Wi-Fi Alliance mostly focused on the standards that related to improvements in bandwidth and throughput: 802.11g, 802.11n, 802.11ac, and 802.11ax. Occasionally, the trade group would add another term, like WMM for QoS (802.11e), which further muddied the waters. Some manufacturers also added their own spin, with marketing terms like Wireless-N plastered on boxes. But consumers generally had to look for standard names on the packaging or in the interface to determine a product’s capabilities, so a Wi-Fi router might support <deep breath> 802.11a, b, e, g, h, i, j, n, y, and ac. And now, if you’ll excuse me, I have to go run some search-and-replace passes in my book Take Control of Wi-Fi Networking and Security so the next update can account for these new names.